SOLO features not one, but two motion elements, resulting in a unique sitting experience that is both ergonomically sound and fun. With the additional Monopad, SOLO lends itself perfectly to the use of mobile devices.ROVO SOLO, the new stool, brings motion to the workplace. Sitting, standing, moving are alternating almost automatically. The SOLO is a complete novelty which was developed by ROVO together with Mr. Henner Jahns, General Manager of design office Gecco Vision. 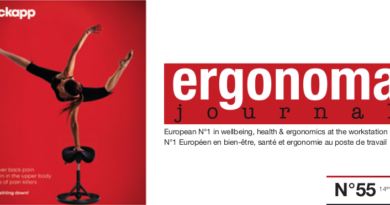 The concept of flexible movement to promote health is essentially based on the proven and patented ERGO BALANCE technology which is integrated in the foot and also under the seat. The two different elastomers guarantee a secure hold in each position. To be able to sit in this way improves the circulation and relieves strain on the spinal column and intervertebral discs. The design (Gecco Vision) very clearly communicates the function of this seating furniture. In the standard version a ring encircles the seat cushion. So you can easily carry, shift or move the ROVO SOLO. The ROVO SOLO is a product with fun factor which brings a breeze of fresh air into the office and the work environments. The program is ch aracterized by a wide variety of colour and design possibilities. For example the ROVO SOLO is available with a monopad which offers a lot of different applications. While sitting this monopad gives a limitation to the pelvic and back areas or you can use it as armrest or for storage. It is intended that the user may often change his sitting posture. The ROVO SOLO turns to be a product with fun and will convince many users. Two different heightadjustments make the ROVO SOLO suitable to be used as stand or sit stool.